Kudos to Newt Gingrich. Romney should offer his a position in his administration. 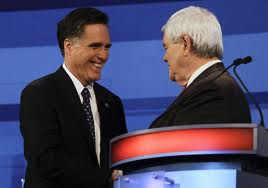 WASHINGTON — One-time Republican presidential candidate Newt Gingrich is asking the delegates he won during the GOP primary race to support the presumptive nominee, Mitt Romney. In an open letter to delegates released Tuesday, Gingrich says it’s time for all Republicans to come together to defeat President Barack Obama and Vice President Joe Biden.